California and some other areas require a 5/8" spark arrestor to fulfill regulatory codes. So we carry 5/8" mesh in addition to our 3/4" mesh. Yep, it';s the same screen that's used in the construction of Gelco chimney caps. It comes in 96" lengths in 8", 12", and 16" widths. Stainless steel mesh is for those chimneys with decorative stone or brick tops where you cannot install a traditional chimney cap. 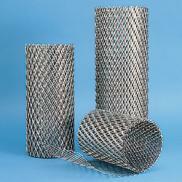 This mesh is made of heavy 18-ga. stainless steel. Roll of Stainless 5/8" Mesh; 8" x 96"
Roll of Stainless 5/8" Mesh;12" x 96"
Roll of Stainless 5/8" Mesh;16" x 96"